If there’s a scope that can do it almost everything, it is the Viper HST from Vortex. This riflescope blends the best characteristics of the PST and HS from Viper models and puts them together in one of the most dynamic yet efficient at long-range scopes in the market. The Viper HS-T is an incredible scope for almost all range of applications. From bolts to AR rifles, to even semi-automatic rifles or automatic snipers, you can get the best from it without having to worry about accuracy, precision, or dynamism. You will merely lock-in and shoot any target from 50 up to 400 yards without problems thanks to the 4x magnification – and always in the easiest of ways. The Viper HS-T is a scope that is worth more than you think. Want to know why it is so good? Then keep reading and find out! With the Viper HS-T 6-24x50 you get the VMR-1 reticle, a standard yet handy scope for those who like high efficiency & versatility at the same time. This one, however, offers many other features, including the MOA & MRAD options for different needs. Either the MOA or the MRAD can be used in holdovers, with different processing ranges, to correct windage, and even to follow moving targets without problems. Of course, they are pretty different from each other when reading, yet they deliver an incredible performance. Apart from that, the reticle, in general, comes with the SFP (Second Focal Plane) feature, which allows every user to change the size of the reticle while they magnify the vision when aiming. Especially when it comes to long-range shooting, this reticle will provide one of the most versatile performances you can think of. Apart from all that, the reticle comes with a fast-focus eyepiece that allows users to adjust & quickly focus different targets in a rapid mode, without having to waste time or feel uncomfortable while doing it. And when you add the excellent sub-tensions on the reticle, you get even more help to make the best shots without any problem. The Vortex Viper HS-T is a medium-high range scope, and for its quality, it easily meets the highest standards on gun accessories. To see this, you need to look at its premium lens and coatings directly. The XD Lens, for example, offer extra-low dispersion and one of the best resolutions in the market, alongside top-notch color and the sharp image you can think of. Then add the XR multi-coatings plus the Armortek feature, and you get excellent, crisp vision plus one of the most reliable and quality images. All of these features together make the Viper HST stand out from the crowd, offering extraordinarily light & bright images with amazing clear & crisp images. What’s more, you get excellent magnification with outstanding color, so you have almost everything you could need on a unique device. Getting 4x zoom and up to 18x in magnification, you are getting outstanding versatility to shoot accurately either on medium or in long ranges. However, what’s really good about this is the ability to get the same type of accuracy no matter what adjustments you make. With the tactical windage & elevation adjustments plus the reticle, and highly versatile additional features, magnifying and adjusting the scope to your needs is a total piece of cake. No matter how or why, targeting & aiming accurately is surprisingly precise with this scope, even with different types of guns. Quick, easy, precise, and utterly durable design that allows you to make changes that fit your expectations. A total blast of scope for the versatile and demanding user – and even more so when you consider the high-quality eyepiece of superior comfort. Being convenient helps users to make the adjustments they want without problems, use the scope in different guns effortlessly, and at the same time use the scope for a wide array of applications without fearing inaccuracy or lack of precision. And that’s what you get with the Viper HS-T. 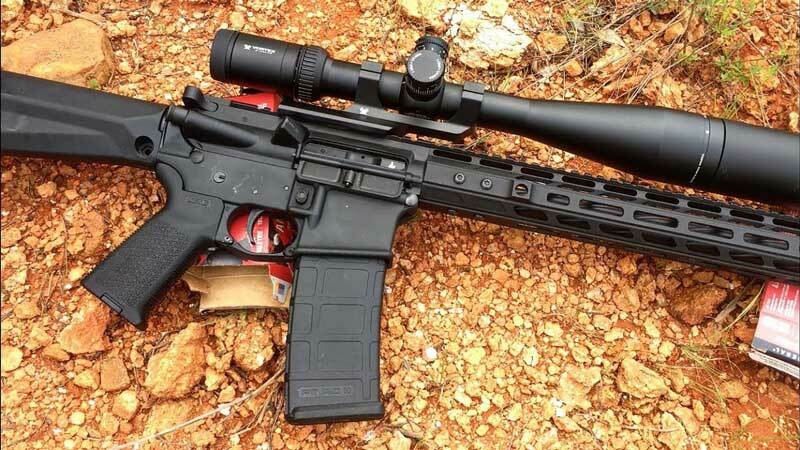 The 6-24x50 version, for example, will allow you to mount the accessory on bolt guns, snipers, and AR rifles without fearing lack of comfort or precision problems. What’s more, you get, no matter where and how you use it, the ability to continually change the turret adjustments to your desires, making sure you get convenience to the max. This is all offered by both the turret-style targeting adjustment knobs as well as with the CRS Zero Stop design, both incredibly well-made and integrated with such quality that you will feel like using an excellent accessory. Apart from having the best features from the PST and HS models from the Vortex Viper’s, you also get the best-proved designs that provide strength, resistance & durability. With a 30mm aluminum body tube and a one-piece design, the Viper HS-T is almost unbreakable. Add the solid construction of the lens,and you get a merely-fantastic build that will take you anywhere you want, and will always help you get the best experience without problems. Whether it is during harsh rainy environments or demanding shooting activities, you won’t have to worry about the integrity of the scope for one bit. It’s like having an indestructible accessory. Thanks to the O-ring, the argon-purged build, and the overall shock-proof aircraft-grade aluminum – the Viper HS-T will undoubtedly leave a great impression on anyone regarding making quality. At 50 yards to infinity, it is seemingly a decent parallax for almost any type of application. However, most users think otherwise. The parallax problem of the Viper HS-T won’t make you miss any shot or harm your aiming ability, yet they could become annoying and uncomfortable when trying to change magnification from time to time. A problem with parallax harms the way you see through the scope, even with the proper eye relief and overall application, if the parallax is not perfect very likely you will have an uncomfortable moment when using the scope. But the problem is not as bad as you think. With a few uses, you get along with the parallax fine enough, and you eventually forget its minimal drawback. 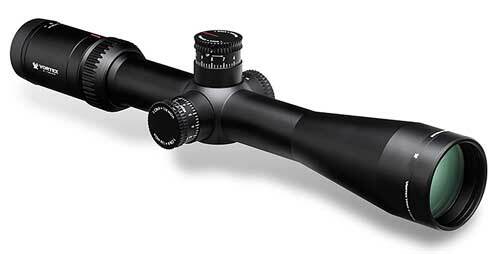 Is the Vortex Viper HS-T a Worthy High-Cost Scope? For the demanding user who wants much more than a simple scope with standard magnification and standard construction, there’s the Viper HS-T to meet his expectations. With the quality of the lens, the coatings on the optical system, the outstanding versatility of its adjustments, and the convenient design make the Viper HS-T a magnificent option for those users that never get satisfied with less than high-quality accessories. Choosing the Viper HS-T from Vortex is immediately making sure that even the highest standards will be met. No matter how you intend to use this scope, it will undoubtedlyhelp. Not the best for close range, of course, and not the most parallax-free in the market, yet an outstanding option for the long-range user who wants a product that stands out.